Second Division And Proud: SAFE EUROPEAN AWAY? Anyway whilst the takeover saga rolls on we get a few more days off before playing another league match. Let’s hope we can get a result on Tuesday because, with most other teams playing competitively at the weekend, we may be looking closer to the Third Division than the European Cup. Anyway, having sat on the fence for too long I’m giving a yay to the Maktoums. Lots and lots has / will been written so I won’t go into great depth but I must admit I’ve been a bit worried about our home / identity / integrity / beer etc, but at the end of the day I am a realist (sometimes) and we need something in order to secure our medium to long term existence. I know I’m probably in a minority of one or two but I really would rather watch a team of Charlton players signed as trainees (all born within the Borough of Greenwich would be nice) play in the third division, at the Valley of course, and be owned by people who support the club (like some of the fantastic people we had / have recently in charge at the club – they are / will be missed greatly) than a foreign owned team of JFH-alike mercinaries poncing it up in front of a load of plastics. 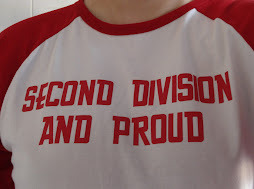 (That’s part of the point why I started this blog – we’re in the second division and I don’t care what my mates who support manyoo, arsenal or west spam say, I am proud of that – and very proud of the club this plays in this division!) But that’s not going to happen and the times they are a changing as CND points out. Hell football’s changing, I’m changing, you’re changing, the world’s bloody changing and whilst it might not always be for the better we have to accept that so (gulp) I am accepting it and doing so as I believe this will be a good thing for us in the long term because more than I’d like the ‘good’, ‘little’, ‘old’ Charlton I love and adore to stay the way it was (rather even than the way it is in some ways) there’s one thing I’d like even more. Here's the crunch ('stop going oin about the crunch, have you even been to the crunch?') ... When my boy’s old enough to decide he wants to support The Addicks rather than be force fed at every opportunity, then bugger me ... there’s still a club for him to support!!! So thank you Messers Alwen, Bartram, Curbishley, Di Canio, Kinsella, Lawrence, Murray, Peacock, Seed, Shirtliff, Simons and Welsh (to name just a few that spring to mind – the list is extensive). But you’re all a part of what’s good about my club - our club - and I love you all for that. So to Mohammed Al Hashimi (and his esteemed associates) - thank you too (wasn’t that hard, was it?) I trust the club is being brought with good intentions and thank you for ensuring we stay around for at least another hundred or so years – stay a while wont you please? If you get the chance check out an excellent read from drinking during the game, which I most enjoyed reading yesterday – let’s hope others read it too. UP THE ADDICKS - JOIN THE REVOLUTION !! !